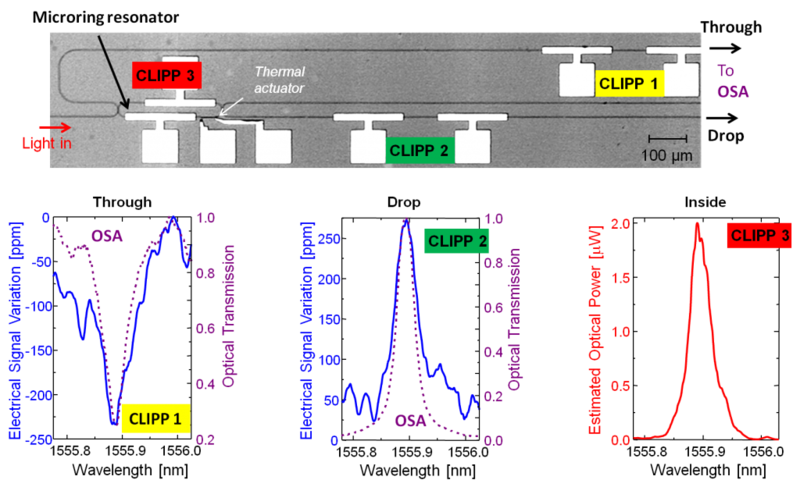 In 2014 we have conceived and developed CLIPP (Contactless Integrated Photonic Probe), that is the first integrated device enabling noninvasive light observation in optical waveguides. Near-infrared light propagating in semiconductor waveguides (such silicon or indium posphide) leaves some footprints behind. Despite material transparency, free carriers are generated at the core/cladding interface due to surface state absorption (SSA), occurring in the first 2-3 silicon atomic layers. CLIPP is able to detect these carriers and infer information on how many photons have passed through the waveguide. And this can be done without wasting any extra photon. To be truly noninvasive, the waveguide must remain completely untouched. To this aim, CLIPP performs a “remote” sensing: the light-dependent change of the electrical conductivity of the waveguide is measured though a contactless capacitive access to the waveguide core. All we need is a two-electrode arrangement, driven at a suitable a.c. voltage, and a high sensitivity impedance measurement system based on a low noise transimpedance amplifier and a lock-in detector. High sensitivity does not mean complexity. The CLIPP concept has been demonstrated in silicon and indium phosphide technologies. The CLIPP can be very compact (less than 100 μm length), work on single-mode and multi-mode waveguides, and on both polarizations (TE/TM). Light intensity monitoring can be performed with a sensitivity down to -30 dBm, 40 dB dynamic range and μs-scale time response. The CLIPP is a truly transparent in-line light detector. It introduces neither loss nor amplitude modulation. An extremely small phase modulation was observed (<1 mrad), corresponding to < 0.5 ppm perturbation of the waveguide effective index (comparable to 3 mK fluctuations). This perturbation is negligible even for resonators with a Q factor of up to 1,000,000. Compactness, light transparency, ease of fabrication and simultaneous read-out of many channels trough CMOS electronics enable the integration of many CLIPPs inside generic PICs without constraining the design and technology of the waveguide underneath. Many light monitors can be placed in strategic positions around the chip enabling real time management of complex integrated optical systems. For instance, we fabricated silicon microring resonators with CLIPPs integrated at the Through and Drop ports, and inside the resonator itself, thus accessing information not available with conventional photodetectors. Automated tuning, feedback locking and stabilization. The CLIPP can be used as a transparent detector for the realization of local feedback loops, thus making the control of devices integrated into complex circuits as if they were stand-alone. For instance, we have integrated a CLIPP inside thermally actuated microring resonator and exploited is as a monitor to automatically tune the ring’s resonance to overlap with the wavelength of an external laser. After tuning, in order to have the resonator wavelength always locked to that of the laser, the CLIPP continuously monitors the intracavity optical intensity, providing a feedback error signal to the thermal actuator steering the resonance of the ring. Automated fiber to waveguide alignment. 1. F. Morichetti, S. Grillanda, M. Carminati, G. Ferrari, M. Sampietro, M. J. Strain, M. Sorel, and A. Melloni, “Non-invasive on-chip light observation by contactless waveguide conductivity monitoring,” J. Selected Topics in Quantum Electronics, vol. 20, no. 4, Jul./Aug. 2014. 2. S. Grillanda, M. Carminati, F. Morichetti, P. Ciccarella, A. Annoni, G. Ferrari, M. Strain, M. Sorel, M. Sampietro, A. Melloni, “Noninvasive monitoring and control in silicon photonics using CMOS integrated electronics,” Optica, vol.1 no. 3, pp. 129-136, Sep. 2014. 3. M. Carminati, S. Grillanda, P. Ciccarella, G. Ferrari, M. J. Strain, M. Sampietro, A. Melloni, and F.Morichetti, “Fiber to waveguide alignment assisted by a transparent integrated light monitor,” IEEE Photonic Technology Letters, vol. 25, no.5 , pp. 510-513, Dec. 2014. 4. 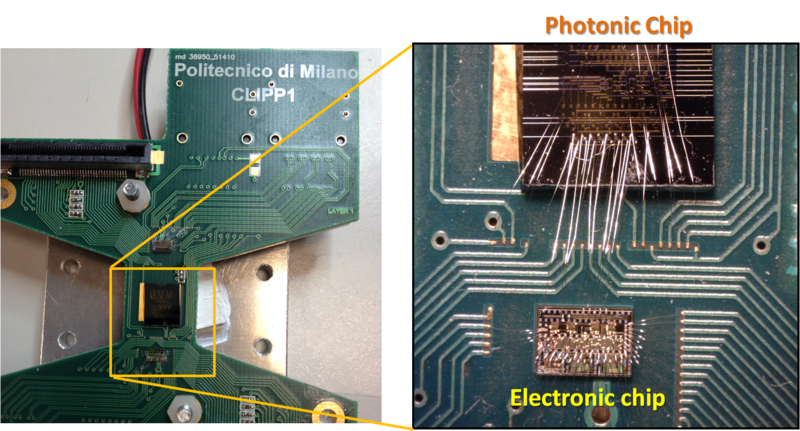 S. Grillanda, F. Morichetti, N. Peserico, P. Ciccarella, A. Annoni, M. Carminati, and A. Melloni, “Non-Invasive monitoring of mode-division multiplexed channels on a silicon photonic chip,” J. Lightwave Technology, in press (10.1109/JLT.2014.2377558). The CLIPP research activity is being carried out within the framework of the EU Project BBOI.